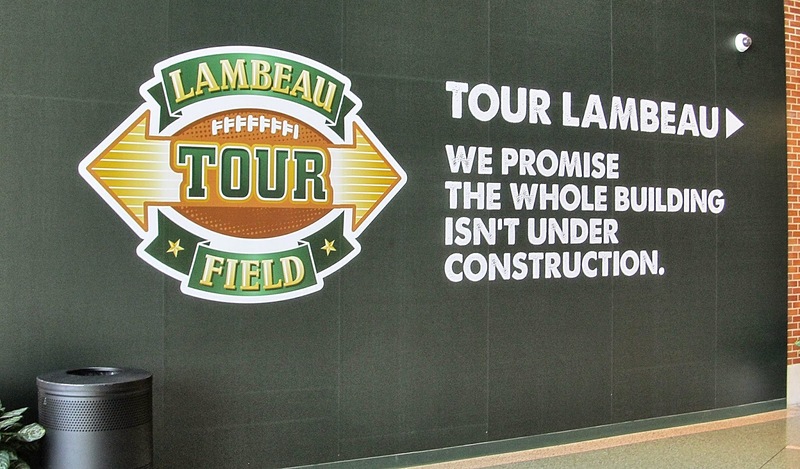 Back in June I got to take a tour of Lambeau Field for the first time. 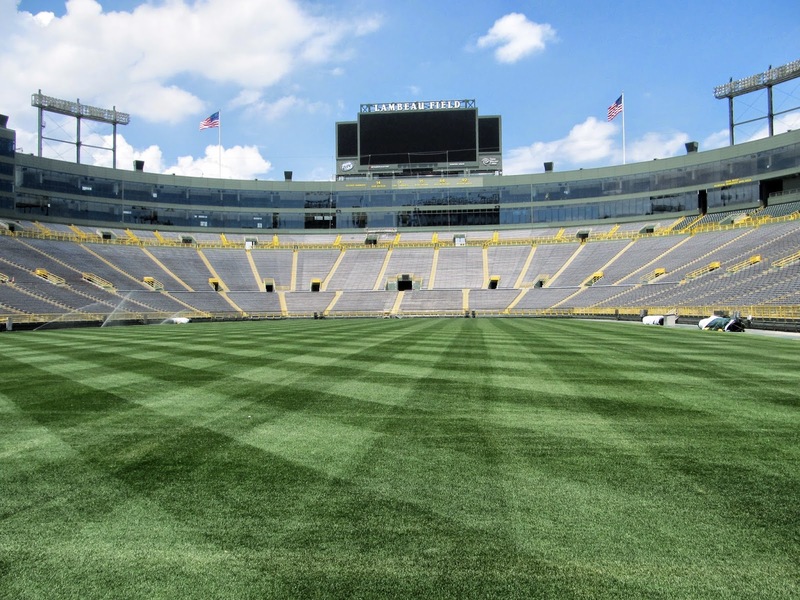 I've been to the stadium many times either just to take photos or to visit the Packer Pro Shop but I had never taken a stadium tour before. 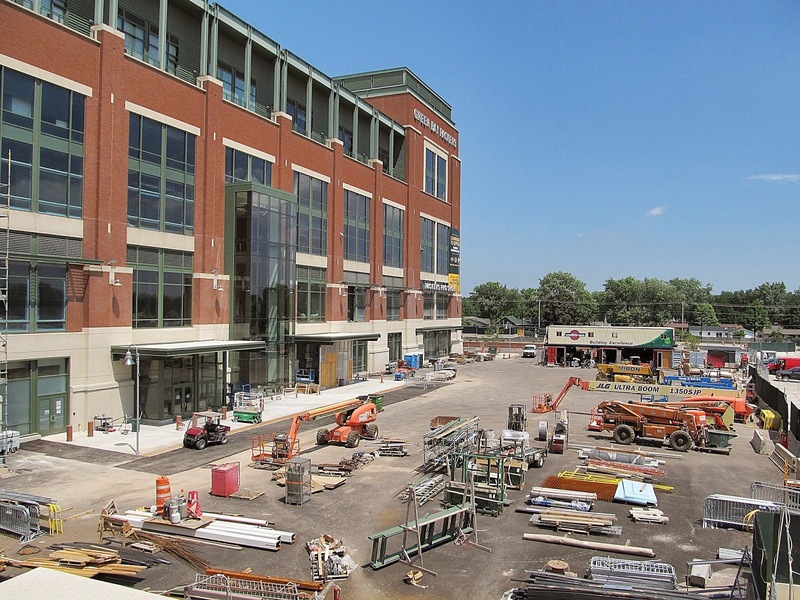 I had also hoped to visit the Packer Hall of Fame but it turned out that this summer it was temporarily relocated away from Lambeau as they are doing construction on a new Hall of Fame and Packer Pro Shop. Here's some of the construction you can see while walking into the stadium. The construction should be done by the start of the season. 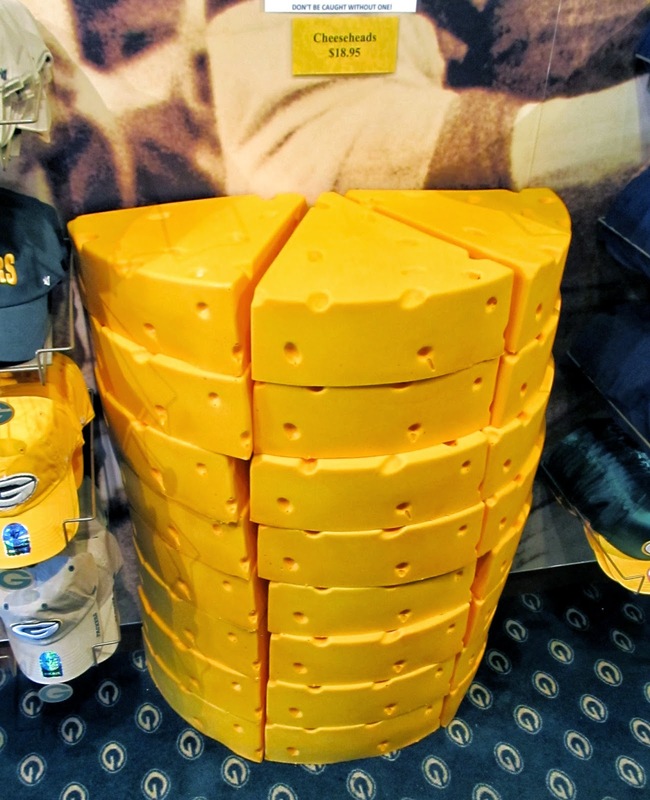 Before the tour I stopped by the Pro Shop and saw this great display of Cheeseheads. Do a little research later I was surprised to find that the origin of these hats comes from the Milwaukee Brewers rather than the Packers. 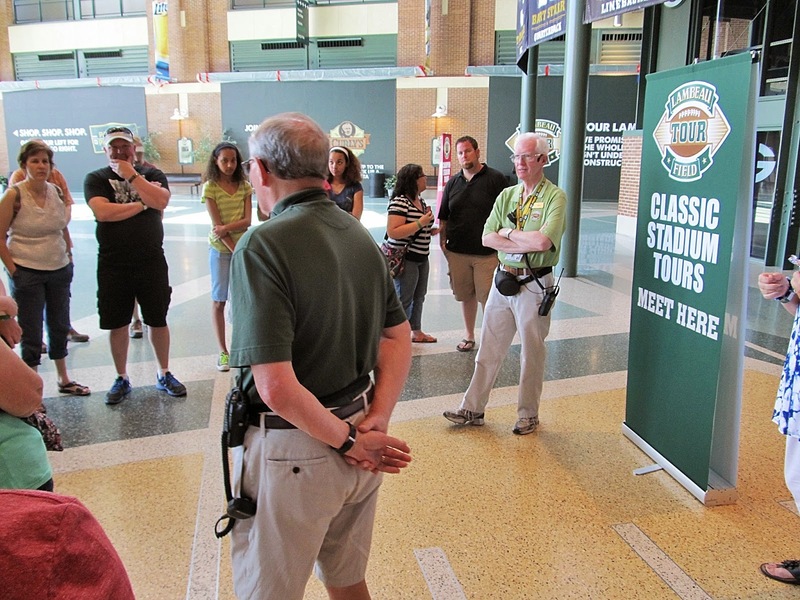 On to the tour which turned out to be exactly as I had hoped, run by two retired old guys that really really loved the Packers. We go to go up to one of the high-priced executive boxes to view the field from above. While we were touring the ground keepers were mowing the field which is done every two days. 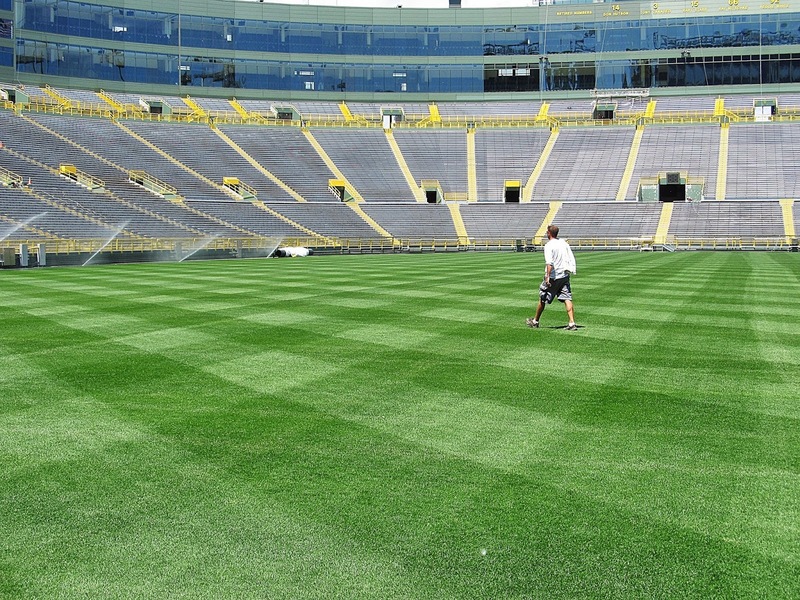 I entitled this photo "The loneliness of a Green Bay Packers groundskeeper." 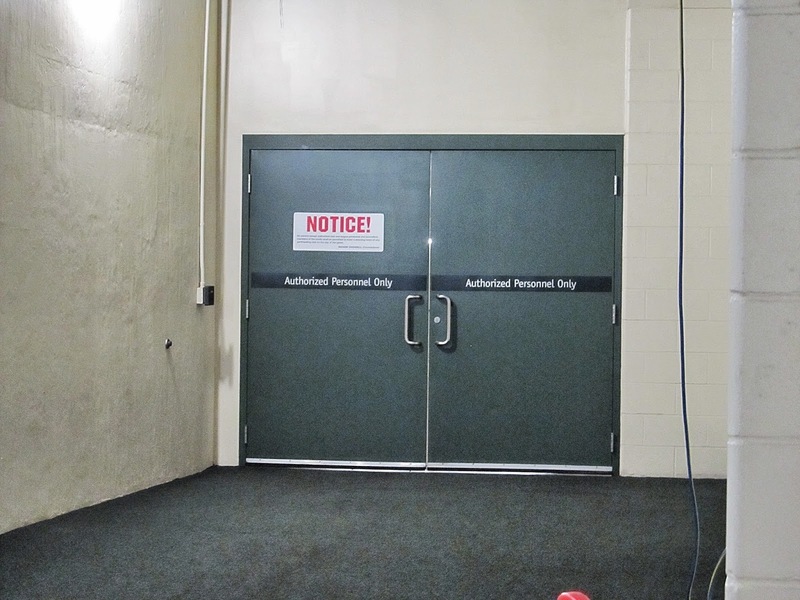 ...the home locker room is behind these doors. 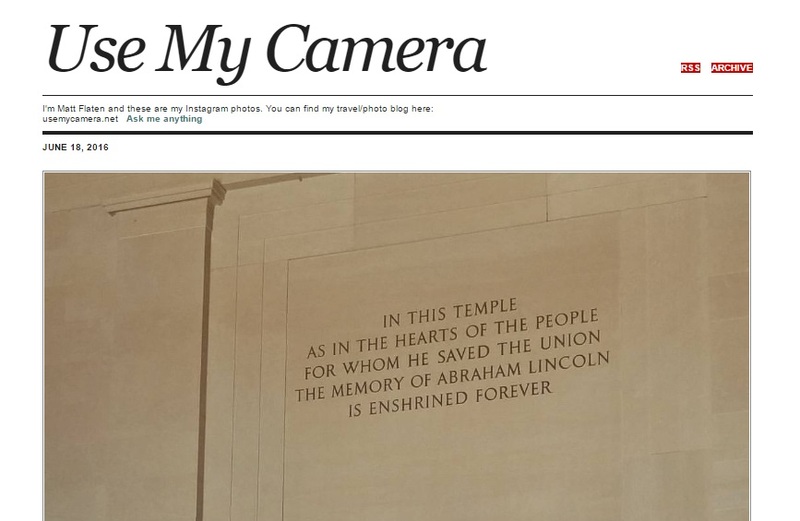 We didn't get a chance to see it for ourselves. 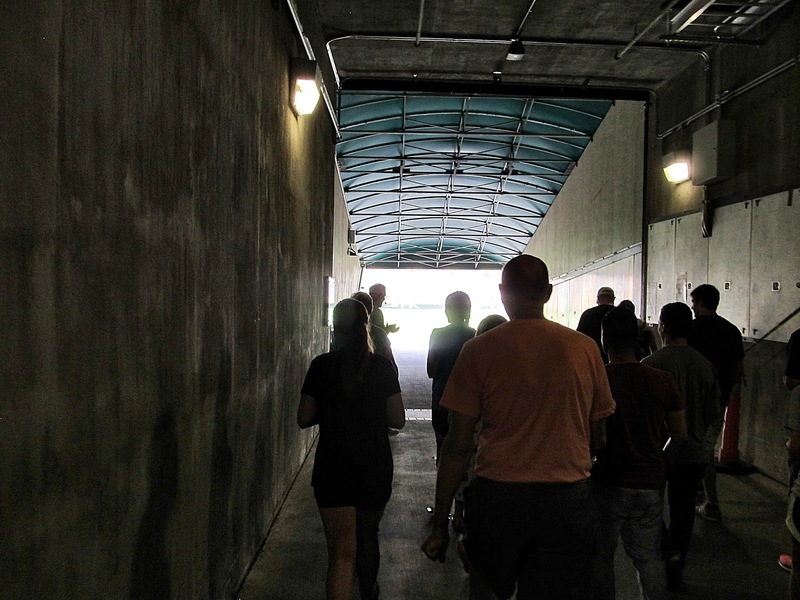 Players come out of the locker room and down through this hall to directly out on the field. And as we walked onto the field they played recorded crowd cheers and the announcer's voice announcing the team's arrival onto the field. It was amazing to be able to be on the field after all these years. Well, we weren't on the field as really on the side of the field. 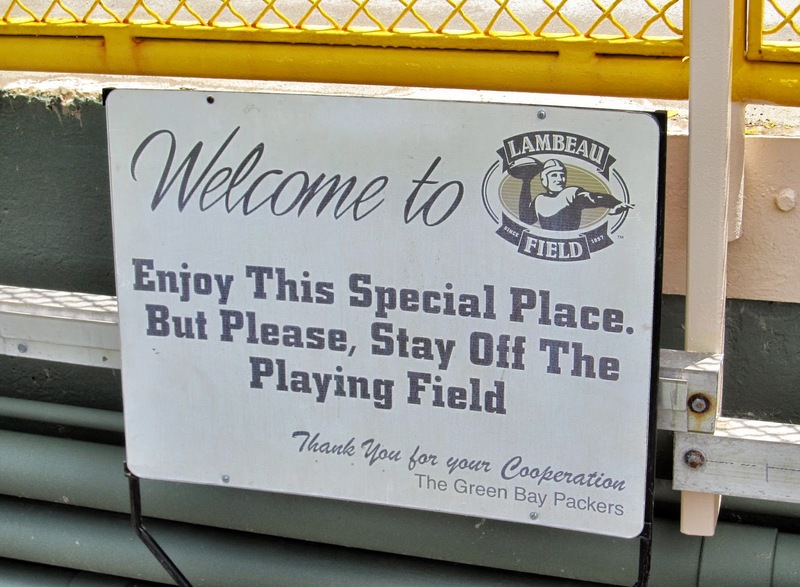 If our guides mentioned it once, they mentioned it 10 times, we couldn't walk out onto the field. 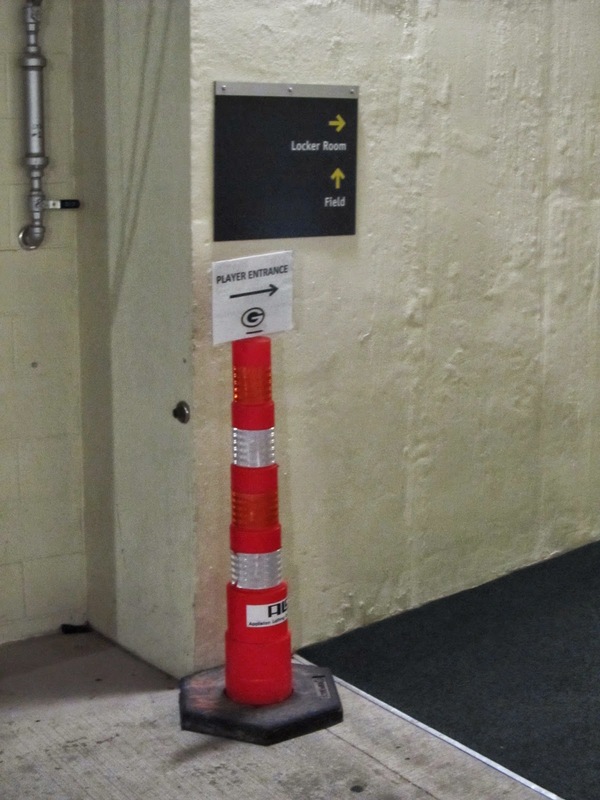 They had these signs to remind us as well. 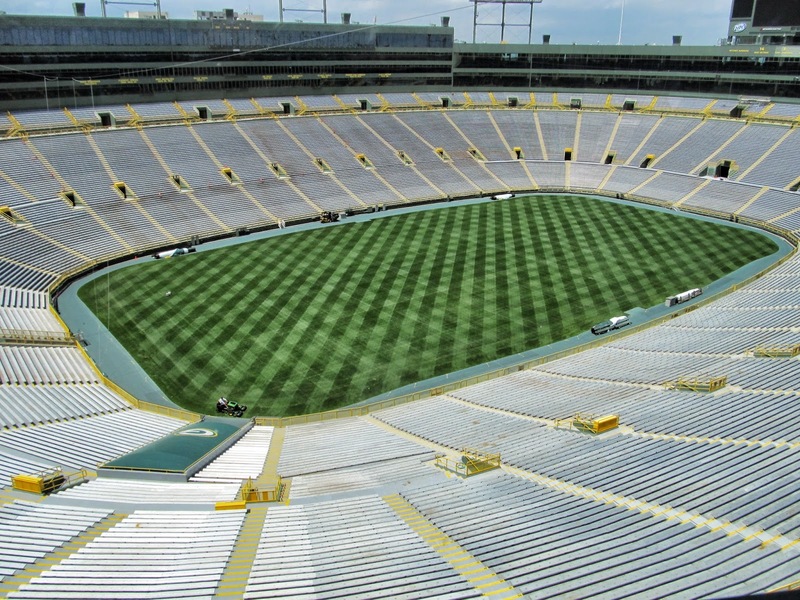 But while we were checking out the acoustics of the stadium by chanting "Go Pack Go" and listening for the echo all of a sudden someone started walking across the field. Our two guides looked at him and started making a move to intercept him and I imagined both of them tackling him like Clay Matthews in the middle of the field but thankfully they realized that that was the groundskeeper we saw earlier in the day mowing the lawn. 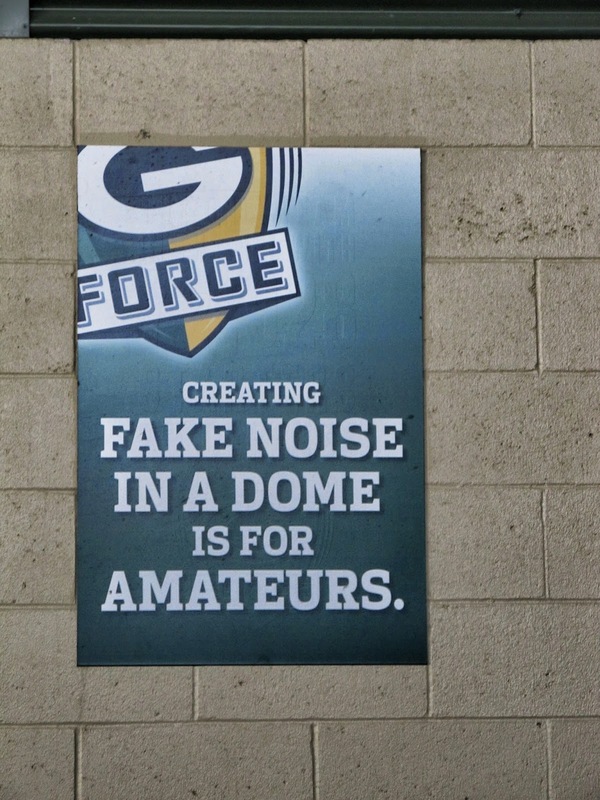 And of course it wouldn't be a Packer tour without poking some fun at the Vikings...although they are going to have to change this when the new Vikings Stadium which will have a fixed roof rather than a dome.